Can you believe it's been nearly 80 years since the first Chevrolet Suburban hit the market? It was the first SUV ever released, and its longevity is a testament to its performance, reliability and willingness to change with the times. The 2014 Chevy Suburban returns for the new model year with additional package options and a new Concord Metallic exterior color. This year, drivers in Phoenix can enjoy the Chevrolet Suburban in three trim levels: LS, LT and LTZ. Each is available in two-wheel drive or four-wheel drive. All come standard with an E85-fuel-compatible 5.3-liter V8 rated at 320 horsepower and 335 lb.-ft. of torque, and is capable of towing up to 8,100 pounds. 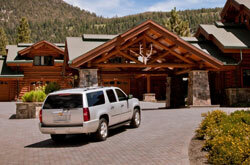 The 2014 Suburban also comes with over 137 feet of interior cargo room and has space for up to nine people. Standard features on the LS base model include: cruise control, tri-zone climate control, power front bucket seats, 17-inch wheels, heated exterior mirrors, power windows, power door locks, a leather-wrapped steering wheel, a six-speaker audio system, Bluetooth and satellite radio. Chevy Suburban reviews note that this attractive entry-level list of features make a compelling argument for serious consideration. If that's not quite enough, consider the Suburban LT and LTZ. These high-level trims still offer relative affordability, but add extra comfort and convenience features, like: rear parking sensors, leather seating, an upgraded Bose stereo system, auto windshield wipers, heated and ventilated seats, navigation and other luxury amenities. After nearly 80 years, the Suburban still represents the best of the world of large SUVs. To learn more, visit Midway Chevrolet, located in Phoenix, and ask to speak to a representative about the new 2014 Suburban. We dare you to compare the latest Suburban model next to rival vehicles like the 2014 Toyota Sequoia, Ford Expedition EL, Buick Enclave, Dodge Durango and the Nissan Armada. That's how confident we are that it's the perfect fit for you. 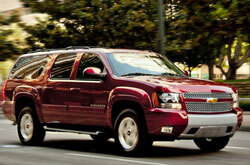 Shoppers will be thankful for the Suburban's affordable price, as well as its sharp styling. When comparing its price to the competition you will certainly see that Phoenix Chevrolet customers select it because it's a remarkable value. Look over the Suburban bullet list underneath this text for more quick facts. 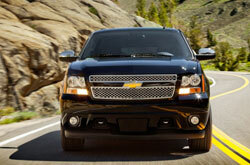 Midway Chevrolet is your source for 2014 Suburban reviews and car comparisons. Good reviews are hard to find ; but as the chief Chevrolet retailer in Phoenix we've put it all in one location for you. This Chevrolet review contains dependable information about the Suburban and it's specifications, safety features and more. After checking out about the 2014 Suburban, please use the form on the right to contact Midway Chevrolet to learn about deals from the OEM and financing offers.